With the Grand National weights having been announced this week, now is the time for the leading contenders to add the finishing touches to their preparation for the big race on April 5th. The Haydock Grand National Trial has proved quite informative down the years and there are several significant entries this weekend. Hawkes Point is the obvious form choice after his fine second in the Coral Welsh National last time out. He ran on courageously right to the line that day but couldn’t quite reel in Mountainous. The form was given a boost when the third horse, Tidal Bay, finished second in Ireland last Sunday in a Grade 1 chase. Hawkes Point is lightly raced and is one of several holding an entry for Aintree so he can be expected to go very close here. The going was bottomless at Chepstow so the heavy ground at Haydock shouldn’t trouble him and he looks a good each-way bet at 6-1 with Bet365. Challenging for favouritism is David Pipe’s talented grey Our Father. He was a disappointment in the Hennessy Gold Cup at Newbury but has deliberately been freshened up for this race. Last year’s winner Well Refreshed was never sighted with a chance at Chepstow but returned a sick horse. Gary Moore is much happier with the ten-year-old now and he returns to the scene of his ten-length victory a year ago. Jonjo O’Neill’s Merry King is starting to prove quite frustrating after four starts this season. He finished runner-up at Ascot first time out but faded in the home straight at Newbury and Chepstow subsequently. Trainer Jonjo O’Neill fitted him with a visor at this venue for the Peter Marsh Chase and he ran on in determined fashion to finish third to Wychwoods Brook. The booking of Tony McCoy could be significant here as the horse seems to need some strong handling and he is sure to be popular with punters. 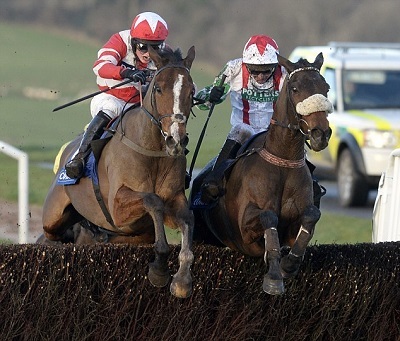 Emperor’s Choice and Rigadin de Beauchene represent the in-form stable of Venetia Williams. The former was impressive when winning in similar conditions at Ffos Las recently and must come into calculations off just 10st 8lb. He has only gone up5lbs for that win and is another that is guaranteed to handle the ground. Rigadin de Beauchene would have a great chance if able to reproduce his game effort of 12 months ago but he pulled up in two subsequent starts and has not raced since. Lucinda Russell’s Nuts N Bolts is a course winner but also has to put a disappointing last run behind him. Wychwoods Brook and Across The Bay also boast previous winning form here and cannot be discounted in a very competitive renewal. Loch Ba could also run well from the bottom of the handicap and has attracted each-way support in the market this week.